We mentioned recently that oil, by way of the spot price (Jan. futures) might find a bottom at around $55. That was tentative at best but after watching it closely the meandering in a fairly tight range may suggest that a lower low may be in the offing. The Japanese candlesticks of the past 3 days would fit the development of a triangle much better than the start of a correction or new bull market. If this analysis is correct one should expect a further drop of about $7 to $10 which would then target about $48 to $45. Lower levels are always possible! Please note that this also is very tentative as the entire sequence is impossible to count. 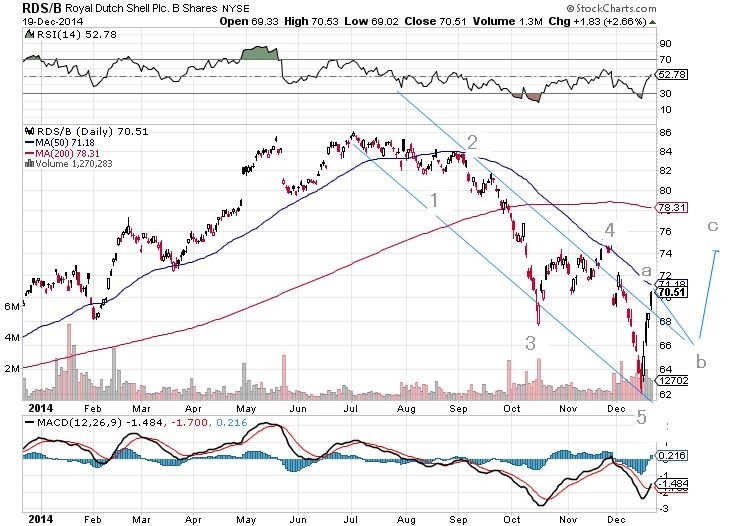 RDS.B seems to be at odds with the above as it has clearly completed a 5-wave move. But both views are not entirely incompatible with each other as there we may need a sizeable b-wave down just about at the time the triangle would end – that is if there is not a triangle 4th wave forming there as well – . Ultimately this stock should go down much further (see previous blogs).